Q. At what age can my child Write to Rachel? Write to Rachel can be adapted for any age. Adults can even use it to practise their written English. It's suitable for any child who can type, or has someone willing to help them. Or, for very young children, see next question. Q. Can the letters be handwritten? In principle, yes. This was one of our first questions. For those of us who struggled with 'presentation' at school, the keyboard is a wonderful liberation. 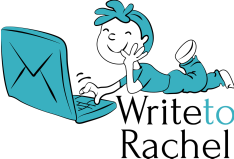 Most children write much more ambitiously when they're allowed to type. However, a handwritten letter arriving in the post is quite exciting. We can provide a handwritten programme on request, at a slightly higher price to reflect both postage and the additional time required. This seems to work well for very young children (Reception and KS1). Another option , if improved handwriting is the goal, would be to let your child receive letters by email, and write back by hand. Q. Should I be helping my child? There are no rules. Families use WritetoRachel in all kinds of ways. Older children will probably want to write independently; younger ones may need a lot of help and encouragement. As long as you're both enjoying it, there's no reason why you shouldn't compose the letter together. It's fine if the child dictates, and fine if you suggest better ways to say things (as long as they don't mind). It's a good idea to get the child, whatever their age, to read the finished product before pressing 'send'. Q. How will Write to Rachel help my child succeed at school? We are not specifically training your child for SATS or any other kind of exams. What we are seeking to do is to help your child enjoy writing, and to recognise that it's worth taking the trouble to express yourself clearly and elegantly. Each week your child receives a personal letter from Rachel to be studied and answered, so that important skills -- reading, comprehension and writing -- are all being practised. In time the benefits will show in all written subjects. Q. Can my child write stories or poems as well as letters? Yes. Your child can write back to Rachel in any form they like. Write to Rachel is designed to encourage your child to learn to enjoy writing and communicating. Rachel will reply in an appropriate and personalised way -- with encouragement and suggestions. Q. Can my child have some additional time to complete his/her Write to Rachel Programme? We understand that your child has a busy and active life. And sometimes other things get in the way of writing a weekly letter to Rachel. That is why we allow a "grace period" after each Write to Rachel Programme to enable your child to catch up on any letters that are a bit late. The "grace period" is different for each Write to Rachel programme, but is normally long enough to allow your child to catch up. For Write to Rachel's Core Programme the grace period is 6 weeks. For Write to Rachel's School Holidays Programme the grace period is 4 weeks for the summer holidays and 2 weeks for the winter/Christmas or spring/Easter holidays programme. For Write to Rachel's extension programmes the grace period is 2 weeks after any relevant month. If your child has not caught up at the end of their grace period then any remaining letters for their programme are lost.